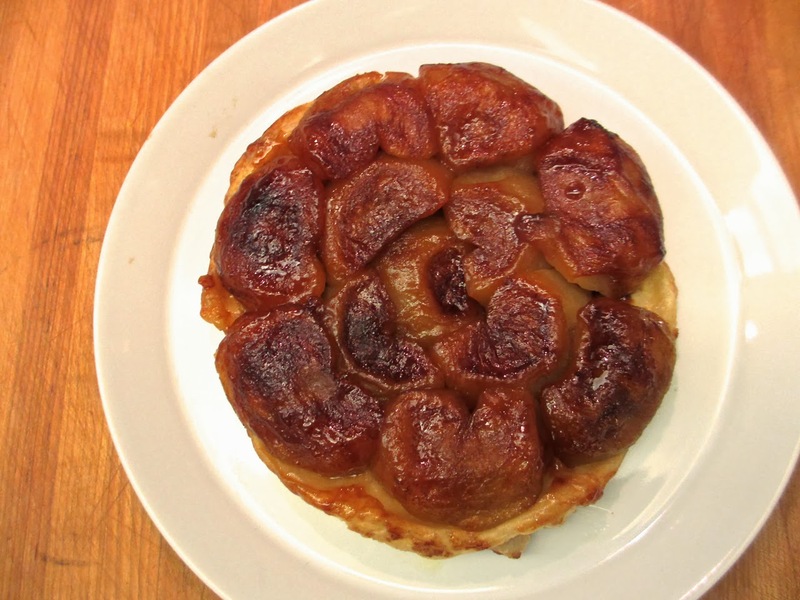 I love making Tarte Tatin, not because it is the best-tasting dessert or even the best-tasting apple dessert, but because it is a challenging thing to do. Every time, you must consider a number of questions before embarking: which recipe, what type of apples (how firm are they at a given time of year), should the apples be sliced in quarters, eighths or halves, make the caramel first and add apples or put the apples on the sugar and butter and cook them all together, what pastry to use (puff pastry, pâte brisée), and finally, what pan to use (non-stick, copper, cast iron). After that, you execute, and every time it is different. But no matter the method, there is always the moment of truth when you must turn the tart upside down over a plate and hope that it slides, perfectly intact, onto the plate with no sticky bits left in the pan. I panic about this less than I used to because I have a lot of experience repairing the ones that did not come away perfectly. That brings me to today and the choices I made. The choice of the Jamin recipe with halved apples was bold (but, inspired by the Olympics, I decided to go for it). I get a good result about 50% of the time when I use this method, because one half of each piece can turn into apple sauce if you don't pay a lot of attention and get lucky. So the moment of truth was unusually tense. But it turned out I nailed it! Beautiful color, apples totally intact, no sticking. Sorry to bore you with all this technical stuff, but the joy of Tarte Tatin is in the details.